“But no human partners, Mr. Spock,” Kirk shook his finger, “I would be the first human.” He shrugged rolling his hands out. Kirk and Spock stepped onto lighted disks on the low transporter platform. Scotty set the coordinates and hit ‘transport’. Sparkling light cylinders formed around the two officers, and their images faded. Turning away, Scotty dragged a finger across the console scrambling the designator. “Mr. Scott,” McCoy gasped, “half of their bodies will be scattered in space.” He found himself staring at a wide-grinning Scotsman. Stardate 952117, Captain’s Log USS Enterprise, Chief Engineer Scott commanding. We lost Captain James T. Kirk and First Science Officer Spock due to a magnetic anomaly during their transport to Bunco-I. We held a memorial service immediately afterward. So bereaved was the crew, they required buckets of Romulan Ale to drown their grief. With the Klingon battle fleet approaching, we delayed our departure to Rura Pente only long enough to beam aboard a few dozen Bunco-I entertainers. These we plan to trade with Rura Pente’s rich dilithium miners. Have you seen recent TV shows, movies, or magazine articles about animal intelligence? What you think about this probably depends on your point of view. Hardline Humanists might begrudge any intelligence—human or animal—that fails their hubristic standards. Perhaps they see themselves as separate from nature, beings apart, “noble in reason … infinite in faculty!” (Hamlet Act II, Scene 2) If dogs were as hubristic as humans, there would be ‘Dogists’. They’d see Hamlet as frivolous and look down their snouts at our poor scent tracking ability. I’m not a Humanist. My God-created universe is filled with creatures with talents and missions different from mine—all animals, not just the cuddly, wide-eyed, furry ones or the ones that sing pretty songs. My wife, Carole, has caught me talking to worms, spiders, and snakes, and I confess to attempting conversations with many others. I don’t expect them to understand or talk back, but one never knows. Maybe animals understand us better than we understand ourselves. 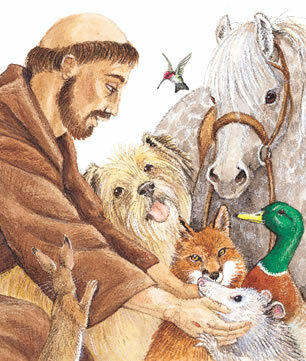 St. Francis blessing the animals. THE SQUIRREL: It was a hot afternoon in July. While uncoiling the hose to water our parched garden, I saw something move in the boxwood beside the house. I backed into the yard, and the creature, a small squirrel, stumbled out after me. I’d heard warnings about rabid animals behaving strangely, but I had another thought. I kicked over a Frisbee, toed it toward the squirrel, and filled it with water. The squirrel buried its face in the plastic pool. After drinking, it watched me water the garden then hopped beside me to the front door. “Want to go in?” It nosed closer to the door, so I let it in. I went to my reading chair while the squirrel checked out the place. When it returned to the center of the room, I said, “Well, come here,” and tapped my leg.” It jumped into my lap. I didn’t think it was someone’s pet; it was too young, half the size of a grown squirrel, and had probably lost its mother before learning to fear humans. The squirrel lived free in and near my back yard for the next two years, stopped by often for lunch, and raised at least two broods of squirrels in that time. I noticed her protruding belly and rows of prominent teats for her first pregnancy, so I wasn’t surprised when she disappeared for a couple weeks. Outside one afternoon, I heard her chittering to me from our cherry tree. On a low branch beside her sat two small squirrels. I waved for her and she came. When her little ones followed, she stopped them, escorted them back to the branch and ‘told’ them to stay, I don’t know how, but they stayed still and were quiet. I offered some peanuts, and she took them back to share with her pups. The next couple weeks, she returned with them several times, but she never let them approach me. When the pups finally left, my squirrel and I went back to our regular routine. I thought she showed good parenting teaching her young not to trust humans or depend on handouts. THE ELEPHANT: Early in my professional training, I had classes on Connecticut Avenue, across the street from the entrance to the Smithsonian National Zoological Park. I brought my own food for lunch and strolled through the park. My route took me past the elephant compound, and I’d fill my jacket pocket with peanuts. One elephant always waited for me and raised her trunk when she saw me coming. I’d wave back and shake her trunk when I got to the compound. She soon discovered which pocket I kept peanuts in and reached for them soon after our initial greetings. That continued for two months until I graduated and went out of town. Ten years later, I was back for a seminar in the same building where I’d done my initial training. For lunch I took a walk in the park. When I got to the elephants, they were all at the far side of the compound, perhaps a hundred yards away. Second- or third-grade children crowded the wall pointing across. One of the escorting teachers explained that they’d visit elephants on another day. “One of these elephants is my friend,” I said, not sure why I butted in. “I’ll call her over.” The teacher bit her lip, trying not to laugh. I waved and got a trunk wave back from the elephant I recognized by the dark splotch on her side. She turned from the herd and trotted across the compound by herself, waving as she came. I shook her trunk then introduced her to each of the children who did the same. Amenities taken care of, the elephant locked onto my gaze and, without further ado, reached into my jacket pocket for peanuts. I’d brought an entire bag, so her trunk made several trips. When we said goodbye, she watched me all the way out of the park. Elephants never forget. THE BEES: Early spring was beautiful in our backyard in Alexandria. A large cherry tree hung over the deck and over our dining table. When the tree bloomed its pink blossoms rivaled anything in D.C.’s cherry blossom festival. We shared this beautiful tree with our neighbors, thousands of them—bumblebees buzzing so loud we had to raise our voices. During our first year together, Carole asked if we’d be safe eating outdoors with all the bees. I answered, yes, that bees have their missions and we have ours. That said, the bees didn’t like intruders and often checked on us while we ate, hovering in for close looks. One afternoon, I came home with bags of groceries in both arms. A sentinel bee hovered above the landing below our front door. Seeing my approach, it rushed up to hover a foot in front of my face. It centered on my eyes, aligned with the bridge of my nose, and shifted to maintain that position if I moved. I’d gone through enough security checkpoints to know when I was being scanned. A couple seconds later, the bee shifted laterally to let me pass then returned to its original position. The rest of the week, I got waved through without delay. 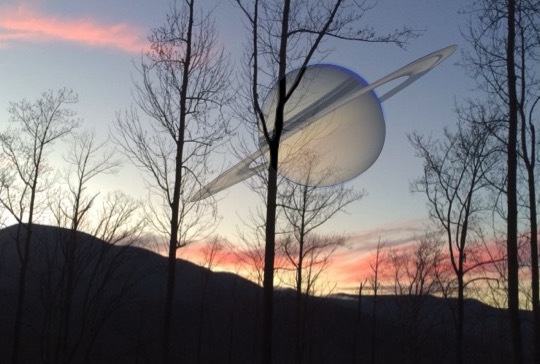 These Earth-bound aliens have a basis to communicate with humans—we have parallel missions. Space aliens may not. Perhaps they’ll communicate through electrical impulses or scent trails. If they send us mathematical formulae to test our intelligence, might we mistake them for cilantro?